The Windows Registry is usually one of the main problems for any computer, because trouble can arise after installing and uninstalling various programs, adding new system elements, or simply after using it frequently. Due to all the latter, it is advisable to use a Registry cleaner that will help us maintain it in topnotch conditions, and thus avoid our computer malfunctioning. 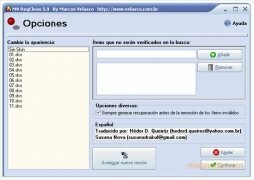 MV RegClean is a free application developed by Marcos Velasco Security, that allows us to eliminate the unnecessary entries from the Registry by just using a couple of buttons, and thus increase the speed and stability of our system. The program has a very simple interface, that will make the task of cleaning the Registry rather easy for any user, what's more it is totally customizable by means of skins included in the application. If you want to clean you computer's Registry, and you're looking for a simple and free alternative, you should try out MV RegClean.